So, just how lucky are we who live within or in near proximity to the city of Seguin? If “Gwaihir: The Lord of Eagles, Master of Wind” had been in a talkative mood this past Saturday night, I’m sure he would have showered the 400-plus visitors gently traversing the aisles of Seguin’s Heritage Museum with that special knowledge that “we who so live,” nearby and together, are indeed very lucky. Although somewhat dominated by the 15-foot presence of the uniquely impressive “Gwaihir,” the fascinating exhibit, of both Bordes’ work and that of her students, also included (adding to the totality of the evening’s experience) written appendages by heartfelt poetic locals who were asked to provide their “view” of a particular work of wood. Oh, there were a few there who reduced their conversations to the current mind-numbing political chatter. But, the vast majority in attendance, whether young, old, or somewhere in the middle seemed to be caught up in the moment where there truly was a celebratory atmosphere. Underlying the obvious, that of the beauty of the exhibit which initially attracted this totally eclectic group in the first place, was the unstated but widely felt recognition that we were very lucky to live in a community where the arts are recognized for the contribution they continue to make to a joyful life … that the arts, here, are so much a part of our community. As a venue for “Visions in Wood,” the Heritage Museum is perfect. Where else is the historic connective tissue so prevalent than at a central community location where one can come to reflect upon the past and present while keeping a directive eye on the future? John Gesick, the Heritage Museum director, seems to effortlessly make miracles happen within the museum’s walls … often from backstage. With the combined genius of John Gesick and Marika Bordes working on behalf of our community’s heritage and artistic health, we are truly blessed. While it seemed as if there was a majestic symphony in progress throughout the Heritage Museum during last Saturday night’s “opening,” it may have only been the notes of anticipation being subliminally heard in anticipation of Mid-Texas Symphony’s December presentation of The Messiah at Jackson Auditorium on the grounds of Texas Lutheran University. Just imagine that! A very professional and talented symphony orchestra right here in “River City” playing to packed audiences in wonderfully designed performance facilities at our very own highly ranked Texas Lutheran University. How fortunate can we get? Local film maker Chris Elley brought recognition to the Seguin arts’ scene with his movie production of “Barbecue: A Texas Love Story” and, certainly helped to put our very own Texas Theatre in the spotlight a few years ago by helping the local Conservation Society’s efforts to restore that theatre masterpiece into a lasting remembrance of the past while providing untold artistic performance opportunities for many generations to come. The myriad of published authors within Seguin and the surrounding community is both diversified and voluminous. From the likes of Janice Woods Windle and her “True Women” book of excellence, to Charlie Eckhart and his wide collection of cowboy and “old West” books and other writings, to a recent 2010 release of local resident Jim Porter’s book “Two Old Geezer Golfers.” Again, how much better do the artistic talents get here? Of course, any mention of “the arts” in our community would be incomplete without the efforts of various performing arts groups throughout the years. The huge success of Neil Simon’s “Plaza Suite” recently produced by the original Seguin Art Center and performed at the Mosaic Church facility in dinner theater format is a testament of the excellence in performance that seems to be pervasive within our community. And, finally, rumor on “the street” predicts an encore performance of the courtroom scene from “To Kill A Mockingbird” to be performed soon at a Guadalupe County Courthouse near you, on the third floor, with many of the original cast members on the docket. You’ll have to stay tuned for more information about this upcoming local artistic classic. We are so lucky. There is so much more to our community… but, the arts contribute so much! Bob Grafe is a former managing editor of the Seguin Gazette Enterprise and a former chief juvenile probation officer for Guadalupe County. 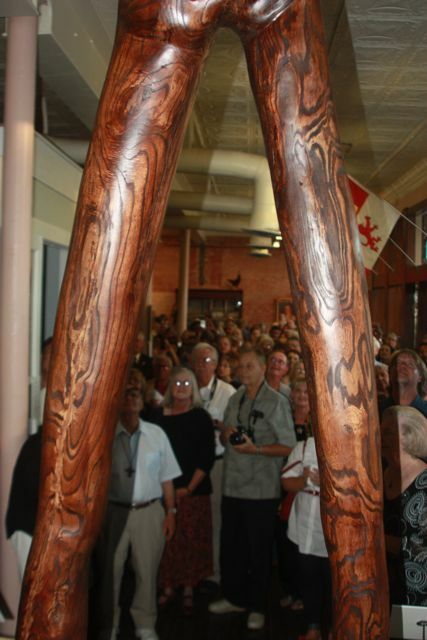 This entry was posted in Seguin Art and tagged Heritage Museum, marika bordes, sculpture exhibition, Seguin Heritage Museum, Visions in Wood, wood sculpture exhibition. Bookmark the permalink.